James Clark was considered one of the foremost sculptors of African wildlife along with Carl Akeley. Both men traveled to Africa in the early 1900s and these expeditions were the basis for their taxidermy work for the exhibits in the American Museum of Natural History. 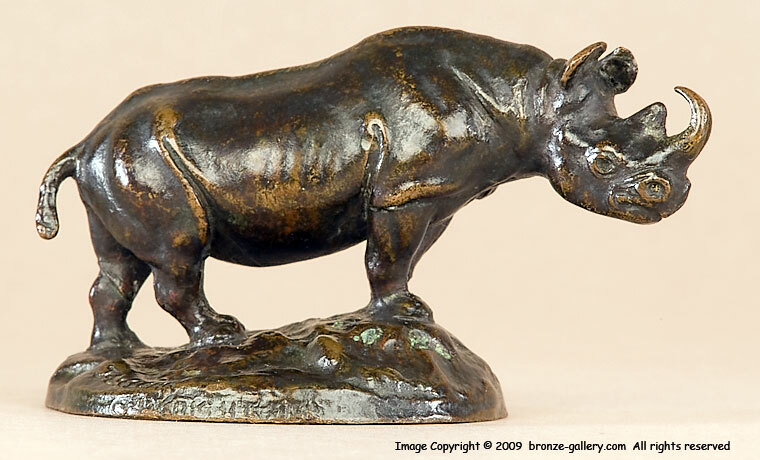 Clark sculpted several different Rhinos in his career and this one is a fine small model that sometimes was mounted on the top of a humidor made from a real rhino's foot. Our little bronze has never been used for this purpose and is a fine cabinet bronze by one of the best American animal sculptors. 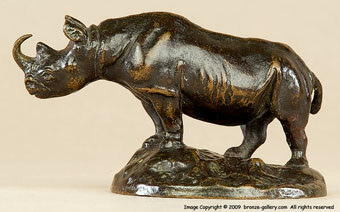 It is a fine cast with a rich brown patina and sharp detail. This bronze was purchased from the estate of a long time employee of the Gorham Foundry so it was cast by Gorham but it does not have their stamp.